In the following, denotes the th spectral frame of the STFT (§7.1), and denotes the spectral envelope of . where denotes the lowpass ``cut-off'' sample. The log-magnitude spectrum of is thus lowpass filtered (the real cepstrum of is ``liftered'') to obtain a smooth spectral envelope. For periodic signals, should be set below the period in samples. 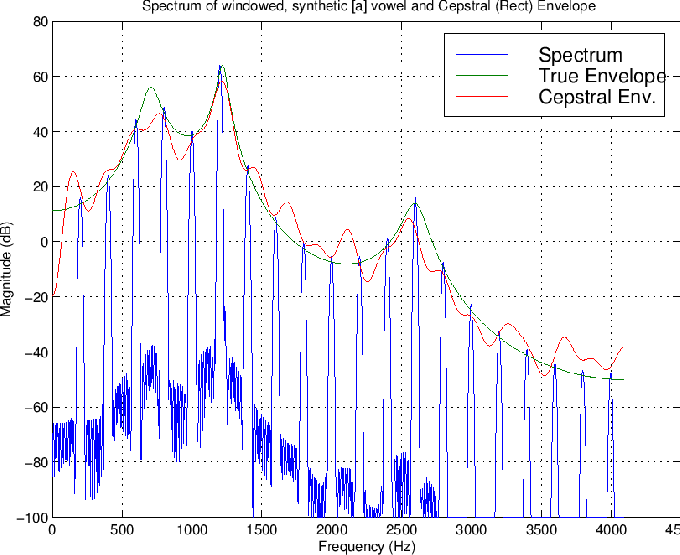 Cepstral coefficients are typically used in speech recognition to characterize spectral envelopes, capturing primarily the formants (spectral resonances) of speech . In audio applications, a warped frequency axis, such as the ERB scale (Appendix E), Bark scale, or Mel frequency scale is typically preferred. Mel Frequency Cepstral Coefficients (MFCC) appear to remain quite standard in speech-recognition front ends, and they are often used to characterize steady-state spectral timbre in Music Information Retrieval (MIR) applications. We call the order of the linear predictor, and the prediction coefficients. The prediction error (or ``innovations sequence'' ) is denoted in (10.4), and it represents all new information entering the signal at time . Because the information is new, is ``unpredictable.'' The predictable component of contains no new information. over some range of , typically an interval over which the signal is stationary (defined in Chapter 6). It turns out that this minimization results in maximally flattening the prediction-error spectrum [11,157,162]. That is, the optimal is a whitening filter (also called an inverse filter). 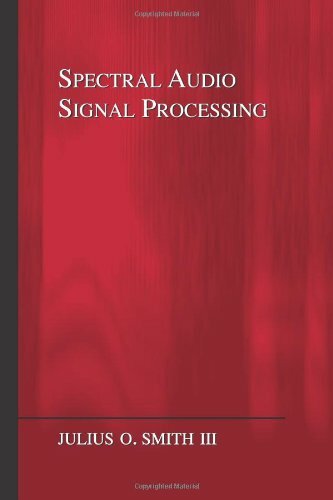 This makes sense in terms of Chapter 6 when one considers that a flat power spectral density corresponds to white noise in the time domain, and only white noise is completely unpredictable from one sample to the next. A non-flat spectrum corresponds to a nonzero correlation between two signal samples separated by some nonzero time interval. From this ``ratio error'' expression in the frequency domain, we can see that contributions to the error are smallest when . Therefore, LP tends to overestimate peaks. LP cannot make arbitrarily large because is constrained to be monic and minimum-phase. It can be shown that the log-magnitude frequency response of every minimum-phase monic polynomial is zero-mean . Therefore, for each peak overestimation, there must be an equal-area ``valley underestimation'' (in a log-magnitude plot over the unit circle). The two classic methods for linear prediction are called the autocorrelation method and the covariance method [162,157]. Both methods solve the linear normal equations (defined below) using different autocorrelation estimates. In the autocorrelation method of linear prediction, the covariance matrix is constructed from the usual Bartlett-window-biased sample autocorrelation function (see Chapter 6), and it has the desirable property that is always minimum phase (i.e., is guaranteed to be stable). However, the autocorrelation method tends to overestimate formant bandwidths; in other words, the filter model is typically overdamped. This can be attributed to implicitly ``predicting zero'' outside of the signal frame, resulting in the Bartlett-window bias in the sample autocorrelation. The covariance method of LP is based on an unbiased autocorrelation estimate (see Eq. (6.4)). As a result, it gives more accurate bandwidths, but it does not guarantee stability. So-called covariance lattice methods and Burg's method were developed to maintain guaranteed stability while giving accuracy comparable to the covariance method of LP . If the rank of the autocorrelation matrix is , then the solution to (10.12) is unique, and this solution is always minimum phase  (i.e., all roots of are inside the unit circle in the plane , so that is always a stable all-pole filter). In practice, the rank of is (with probability 1) whenever includes a noise component. In the noiseless case, if is a sum of sinusoids, each (real) sinusoid at distinct frequency adds 2 to the rank. A dc component, or a component at half the sampling rate, adds 1 to the rank of . The choice of time window for forming a short-time sample autocorrelation and its weighting also affect the rank of . Equation (10.11) applied to a finite-duration frame yields what is called the autocorrelation method of linear prediction . Dividing out the Bartlett-window bias in such a sample autocorrelation yields a result closer to the covariance method of LP. A matlab example is given in §10.3.3 below. The classic covariance method computes an unbiased sample covariance matrix by limiting the summation in (10.11) to a range over which stays within the frame--a so-called ``unwindowed'' method. The autocorrelation method sums over the whole frame and replaces by zero when points outside the frame--a so-called ``windowed'' method (windowed by the rectangular window). 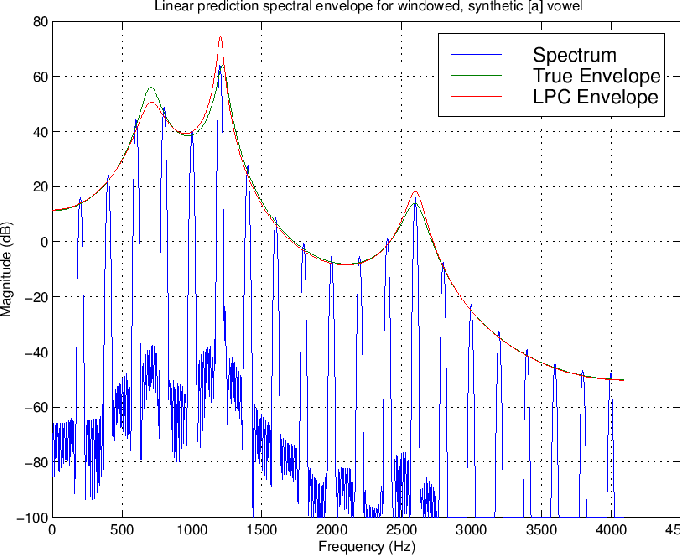 For computing spectral envelopes via linear prediction, the order of the predictor should be chosen large enough that the envelope can follow the contour of the spectrum, but not so large that it follows the spectral ``fine structure'' on a scale not considered to belong in the envelope. In particular, for voice, should be twice the number of spectral formants, and perhaps a little larger to allow more detailed modeling of spectral shape away from the formants. For a sum of quasi sinusoids, the order should be significantly less than twice the number of sinusoids to inhibit modeling the sinusoids as spectral-envelope peaks. For filtered-white-noise, should be close to the order of the filter applied to the white noise, and so on. where is computed from the solution of the Toeplitz normal equations, and is the estimated rms level of the prediction error in the th frame. 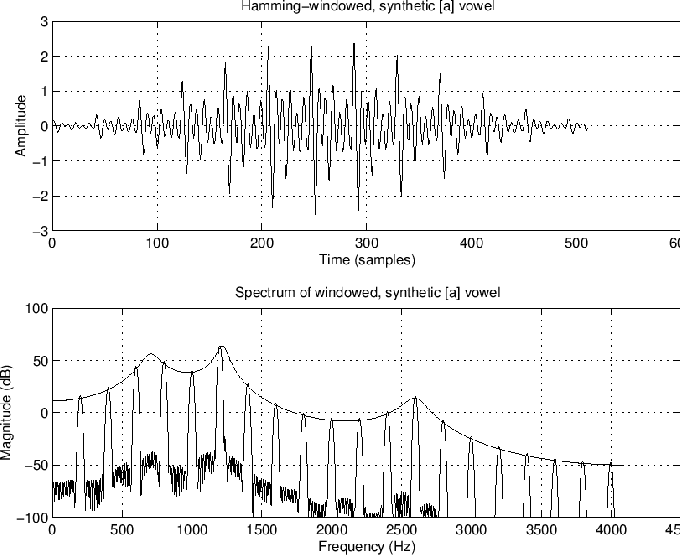 can be driven by unit-variance white noise to produce a filtered-white-noise signal having spectral envelope . We may regard (no absolute value) as the frequency response of the filter in a source-filter decomposition of the signal , where the source is white noise. It bears repeating that is zero mean when is monic and minimum phase (all zeros inside the unit circle). This means, for example, that can be simply estimated as the mean of the log spectral magnitude . For best results, the frequency axis ``seen'' by linear prediction should be warped to an auditory frequency scale, as discussed in Appendix E . This has the effect of increasing the accuracy of low-frequency peaks in the extracted spectral envelope, in accordance with the nonuniform frequency resolution of the inner ear. 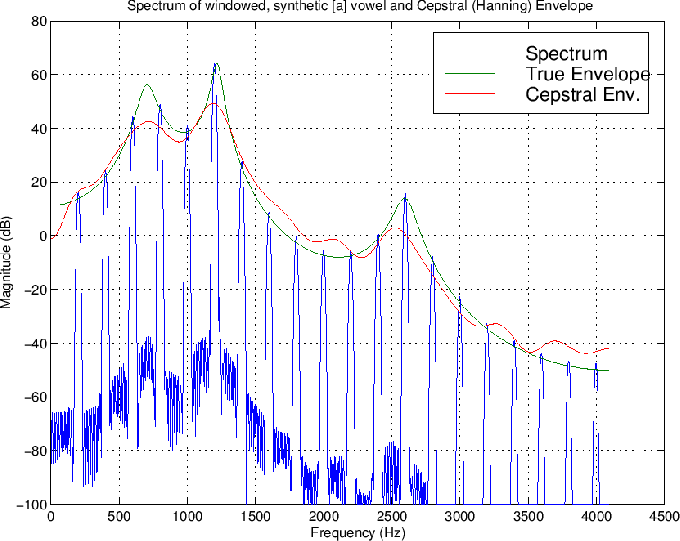 This section presents matlab code for computing spectral envelopes by the cepstral and linear prediction methods discussed above. The signal to be modeled is a synthetic ``ah'' vowel (as in ``father'') synthesized using three formants driven by a bandlimited impulse train . 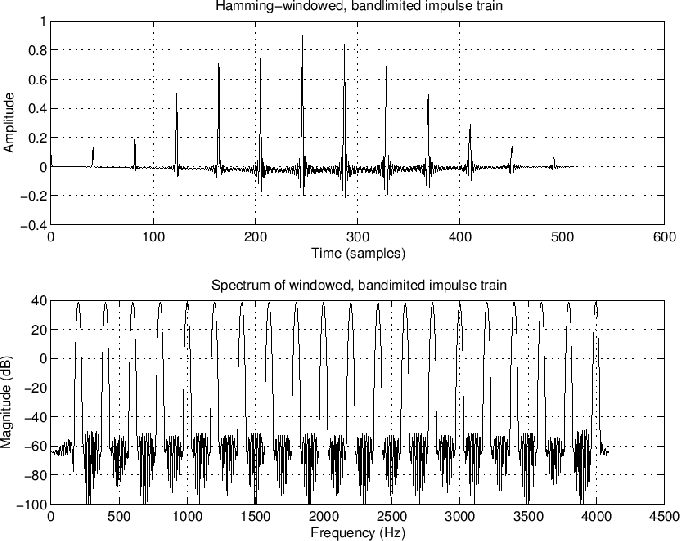 The Hamming-windowed bandlimited impulse train sig and its spectrum are plotted in Fig.10.1. Figure 10.1: Bandlimited impulse train. Figure 10.2 shows the Hamming-windowed synthesized vowel speech, and its spectrum overlaid with the true formant envelope. Figure 10.2: Synthetic vowel in time and frequency domains, with formant envelope overlaid. Figure 10.3 shows the real cepstrum of the synthetic ``ah'' vowel (top) and the same cepstrum truncated to just under a period in length. In theory, this leaves only formant envelope information in the cepstrum. Figure 10.4 shows an overlay of the spectrum, true envelope, and cepstral envelope. 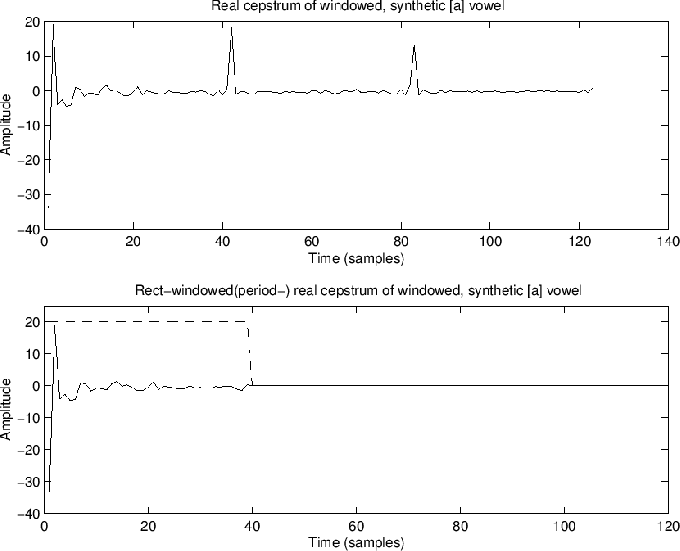 Figure 10.3: Real cepstrum (top) and windowed cepstrum (bottom). Figure 10.4: Overlay of spectrum, true envelope, and cepstral envelope. Instead of simply truncating the cepstrum (a rectangular windowing operation), we can window it more gracefully. Figure 10.5 shows the result of using a Hann window of the same length. The spectral envelope is smoother as a result. Figure 10.5: Overlay of spectrum, true envelope, and cepstral envelope. Finally, let's do an LPC window. It had better be good because the LPC model is exact for this example. In the above example, we implemented essentially the covariance method of LP directly (the autocorrelation estimate was unbiased). The code should run in either Octave or Matlab with the Signal Processing Toolbox. The Octave-Forge lpc function (version 20071212) is a wrapper for the lattice function which implements Burg's method by default. Burg's method has the advantage of guaranteeing stability ( is minimum phase) while yielding accuracy comparable to the covariance method. By uncommenting lines in lpc.m, one can instead use the ``geometric lattice'' or classic autocorrelation method (called ``Yule-Walker'' in lpc.m). For details, ``type lpc''.